The Bedrosians and the Optricans of P2X-416 have been engulfed in an ideological war for decades. The Bedrosians believe that life evolved independently on their planet, and the arrival of SG-1 through the stargate threatens their entire belief system. 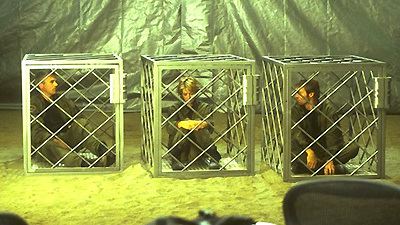 The Bedrosian Commander Rigar captures SG-1 and cages them, interrogating them as spies. Teal'c manages to flee, but is injured and blinded in the escape. With the help of Nyan, a sympathetic young scientist, Teal'c's vision improves, and the two are able to orchestrate a rescue of their comrades before Rigar can destroy SG-1 and all evidence of a stargate. Carter's new cold dialing program searches for new stargates by periodically redialing cartouche stargate addresses that hadn't connected the first time. The planet P2X-416 was the first connection made by the new program. Bedrosia and Optrica are rival continents that have been engulfed in an ideological war for decades. The Optricans believe that humans were brought to the planet by aliens who travelled through a gateway. During the upheaval, a period of violent earthquakes and volcanic eruptions covering most of the continent about 2000 year ago, the gateway was buried and the beings could no longer come through. The Bedrosians believe that the planet and its people were created on Bedrosia by the god Nefertum, without the need of a gateway. Nefertem, the Blue Lotus Blossum of Ra, son of Sekhmet, was an under System Lord to Ra, and probably brought the people to the planet. The Bedrosians believe he is the creator of the planet and its people, as related in their holy book, the Book of Nefertem. The portable naquadah reactor can be used as a power source to manually dial the stargate. Nyan, a scientist with the Research Academy on Bedrosia, returned to Earth and will obtain refugee status to remain as a research assistant to Daniel.